Gmail expanded the concept of Labels to serve as folders a while back. Here comes another improvement bump to “Labels in Gmail”. 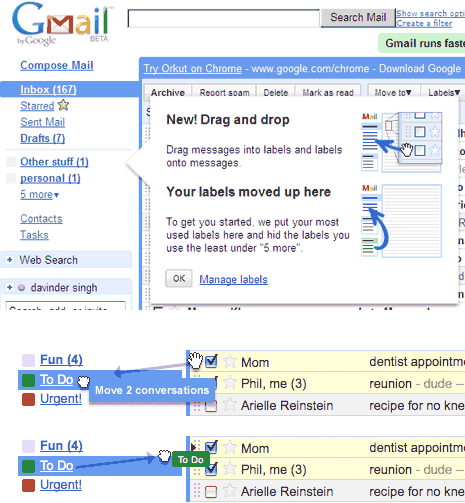 Now you can see and access all labels on the left sidebar of your Gmail inbox. They will display in separate section below drafts links and above chat, search etc. Now Labels support full drag and drop functionality. You can drag and drop any message on any label on the left side. Also, you can drag drop any label to any message in inbox for quick assignments of labels to specific message. Gmail will automatically show most used labels and hide rest. You can click on arrow next to “More” link to see other labels and access them in single click. 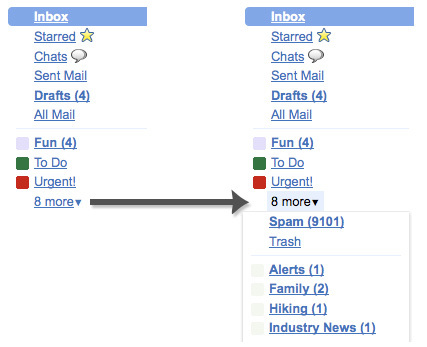 Gmail for sure has done cool job in adding above features to labels for easy management. It has taken the manual clicking work out, now you can assign labels with quick drag drop of messages or labels. Also, you can access all labels with expandable column on left side without having to click through fresh pages. As always, Gmail just got more easy to manage and use! Sharing my view as being a developer on organize mail . i.e. If you do not work on a plan to keep your inbox clean and organized, soon you will lose track of important actionable items and not much later you will see things falling through the cracks. Beyond Inbox can help you organize your inbox of IMAP enabled email account with simple steps. Beyond Inbox can also be effective to backup your account as well as selected emails, you can restore, copy/move, set connection limit, account and more more with it.